Shin guards, knee pads, maybe even a facemask and helmet – but have you considered the crucial importance of a mouth guard for your little athlete? One of the most common sports’ injuries is damaged teeth, but there’s a simple way to help prevent dental disasters out on the field or in the arena: mouthguards. Mouthguards are thick plastic trays that form to the shape of teeth and gums, and create a barrier between top and bottom teeth and protect teeth from being hit from the outside by something like a ball or stick to the face. Mouthguards are available in a wide array of shapes, sizes, even colors and costs, so that you can find one that works best for every individual athlete in your household. 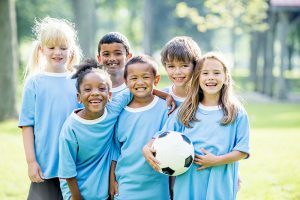 Many sports teams recommend or require mouthguards as a part of the uniform, Beausejour Dental Centre recommends that your child wears a guard regardless of whether or not the coach requires it, especially in high-impact sports. Just think – it’s much better to be safe rather than sorry, especially when you’re talking about risking your child’s beautiful smile and his or her comfort and safety. There are three basic types of mouthguards: over the counter stock guards, over the counter boil and bite guards, and custom fit mouthguards. Stock guards are the least expensive, but are also the least protective. They are pre-formed, and are ready-to-use right out of the package. Though they are convenient, they don’t form to your child’s mouth, so they have to be constantly clenched to stay in place. This can place a lot of strain on your child’s jaw muscles and even contribute to a disorder known as TMJ, which harms the jaw muscles and causes pain and problems long-term. Boil and bite guards are also off the shelf, but require a bit more prep before they are ready to use. These guards require users to boil them in water for a certain amount of time, before placing them in the mouth to allow for a custom formation. Problems that can arise with these types of mouthguards come from the formation process- if a person bites down too hard while the guard is forming, the plastic in certain areas becomes too thin and is therefore not protective. Similarly, because of the pliable nature of the plastic used with these guards, they often only last a handful of sessions before breaking and becoming ineffective. Custom-fit mouthguards are professionally designed and made at Beausejour Dental Centre and are the best option for the most protective, most durable, and most comfortable dental protection. These mouthguards are professionally fitted to your child’s mouth, and they will not lose their shape in the heat of the game. If you have questions about mouthguards, or to have a mouthguard fitted for your child or to schedule his or her next appointment with Beausejour Dental Centre, call 204-268-1782 today!